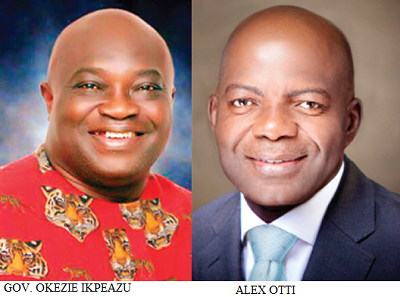 The end to the controversy generated by the Judgement of the Justice Oyebisi Omeleye led Five Member panel of Appeal Court Justices which ordered that Dr Alex Otti,the governorship candidate of the All Progressive Grand Allaince(APGA) to be sworn as Abia state governor is at hand,as the Supreme Court is set to hear the Appeal by Governor Okezie Ikpeazu. An Owerri division of the Court of Appeal had on the 31st of December 2015 ordered the Independent National Electoral Commission to arrange for the swearing in or Alex Otti as Abia governor after cancelling Votes from three Local Government Areas of Obingwa,Osisioma and Isialangwa North,on grounds of Over-voting. Governor Okezie Ikpeazu appealed that Judgement on the 3rd of January 2016 which made it impossible for the order of the Appeal to be carried out by INEC. The issues contained in the rulling of the Appeal court were mainly Over-Voting and Non-Compliance to electoral guidelines by INEC during the conduct of the April governorship election in Abia State. The issue of Over-Voting had been laid to rest on Zamfara State governorship election when Justice John Okoro-led panel of six Supreme Court justices held that the petition filed against Abdulazeez Yari of the All Progressives Congress, APC, as governor of Zamfara state lacked substance, noting that, “The grouse of the appellants in the issue, basically, is that there was over-voting and that because of that there was substantial non-compliance with the Electoral Act. “To prove over-voting, the law is trite that the petitioner must tender the voters’ register. “The court must also see the statement of result in the appropriate forms which would show the number of registered accredited voters and number of actual voters,’’ the court said. Okoro, who stressed that the appellant must also relate each of the documents to the specific area of the case in respect of which documents were tendered, added that the appellant ought to have shown that figures, representing over-voting, if removed, would result in victory for the petitioner. The supreme Court is the APEX court in Nigeria and they ca never contradict their rullings.